This article is about the neighborhood in the City of Los Angeles. For the community in Lassen County, see Westwood, California. Westwood neighborhood as delineated by the Los Angeles Times. Mormon Temple in red. The 2000 census found the forty-seven thousand people living in the neighborhood were generally young and moderately diverse ethnically, with a generally high level of income and education. The neighborhood was developed after 1919, with a new campus of the University of California opened in 1926. Other attractions include Westwood Village, with its historic motion picture theaters, restaurants and shopping, Westwood Village Memorial Park Cemetery and the Hammer Museum. Holmby Hills is considered one of the wealthiest residential areas in Los Angeles, and the Geffen Playhouse attracts theater-goers. A Mormon temple is also prominent. There are several elementary schools and one middle school in the neighborhood. The 2000 U.S. census counted 47,916 residents in the 3.68-square-mile Westwood neighborhood—or 13,036 people per square mile, an average population density for the city. In 2008, the city estimated that the population had increased to 52,041. The median age for residents was 27, considered young for the city; the percentages of residents aged 19 to 34 was among the county's highest. The neighborhood was considered moderately diverse ethnically, with a high percentage of Asians and of whites. The breakdown was whites, 62.9%; Asians, 23.1%; Latinos, 7.0%; blacks, 2.0%; and others, 4.9%. Iran (23.5%) and Taiwan (7.3%) were the most common places of birth for the 31.3% of the residents who were born abroad—about the same percentage as in the city at large. The median yearly household income in 2008 dollars was $68,716, a high figure for Los Angeles. The percentages of households that earned $125,000 yearly and higher or that earned $20,000 or less were high for Los Angeles County. The average household size of two people was low for Los Angeles. Renters occupied 64.1% of the housing stock and house- or apartment owners held 35.9%. The percentages of never-married men and women were among the county's highest. In 2000 there were 309 families headed by single parents, a low percentage for the city. Five percent of the population had served in the military, a low figure for both the city and the county. 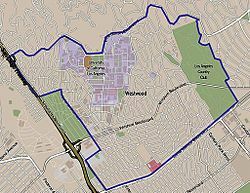 According to the Westwood Neighborhood Council, the Westwood Homeowners Association, and the Los Angeles Times' Mapping L.A. project, Westwood's street and other boundaries are north, Sunset Boulevard; east, Beverly Hills city limits (to include the Los Angeles Country Club); south, Olympic Blvd; and west, the San Diego Freeway (excluding the federal Veterans Administration grounds). Westwood is flanked on the north by Beverly Crest, on the east by Beverly Hills, on the southeast by Century City, on the south by West Los Angeles, on the west by Veterans Administration and Brentwood and on the northwest by Bel-Air. Westwood Village was created by the Janss Investment Company, run by Harold and Edwin Janss and their father, Peter, in the late 1920s as an shopping district and headquarters of the Janss Company. Its boom was complemented by the boom of UCLA (which selected the Westwood Hills as its new home in 1925), developed as a shopping district for the residents of Westwood and the university. Opening in 1929, the design was considered one of the nation's most well-planned and beautifully laid out commercial areas. Harold Janss had hired major architects and instructed them to follow a Mediterranean theme, with clay tile roofs, decorative Spanish tile, paseos, patios and courtyards. Buildings at strategic points, including theaters, used towers to serve as beacons for drivers on Wilshire Boulevard. Janss picked the first slate of businesses and determined their location in the neighborhood; the area opened with 34 businesses, and, despite the Great Depression, had 452 businesses in 1939. The architectural style met a turning point in 1970, when a 24-story office building now known as Oppenheimer Tower was built in the neighborhood and the design of new buildings soon became a mishmash of styles. The Oppenheimer Tower was used for the primary location in the 1978 episode of Emergency!, The Steel Inferno. The neighborhood's popularity continued to rise, with commercial rents peaking in 1988. The area then suffered a major setback in the late 1980s, when gangs began to frequent the neighborhood and bother visitors; the problems culminated in January 1988 when a gang shootout resulted in the death of a 27-year-old bystander. The neighborhood's well-known bookstores and some movie cinemas began closing with the advent of large chain stores, Amazon.com and multiplex theaters. By 1999, the Village was considered to be upscale economically, and today it houses many small and large shops and restaurants. Historically, independent merchants have blamed poor sales on lack of parking; a city-owned garage, on Broxton Avenue, provides two hours of free parking for patrons entering before 6 pm, and $3 flat rate parking from 6 pm to close (typically midnight on weeknights and 3 am on weekends). Parking is still cited as a major problem. Holmby Hills, Bel Air and Beverly Hills form the "Platinum Triangle" of Los Angeles. It is bordered by the city of Beverly Hills on the east, Wilshire Boulevard on the south and Bel Air on the north. North Westwood Village (or North Village) is a mostly multifamily residential neighborhood west of Gayley Avenue and east of Le Conte Avenue where many UCLA students reside. Westwood was developed on the lands of the historic Wolfskill Ranch, a 3,000-acre (12 km2) parcel that was purchased by Arthur Letts, the successful founder of the Broadway, and Bullock's department stores, in 1919. Upon Arthur Lett's death, his son-in-law, Harold Janss, vice president of Janss Investment Company, inherited the land and developed the area and started advertising for new homes in 1922. The Los Angeles Times reported the news: "Westwood, the subdivision of the Wolfskill Ranch, 3,300 acres (13 km2) of scenic territory between the city and Santa Monica, is to be opened to homeseekers and investors today by the Janss Investment Company. The tract comprises approximately 1000 residential and business lots, situated west of the Los Angeles Country Club on Santa Monica Boulevard and the Rancho Country Club on Pico Boulevard." Meanwhile, the Southern Branch of the University of California had been established on Vermont Avenue in Los Angeles, where enrollment expanded so rapidly that by 1925 the institution had outgrown the site. The selection of a new campus in the Westwood hills was announced on March 21, 1925. The owners of the estate, the Janss brothers, agreed to sell the property for approximately $1 million ($12 million in 2018 dollars), less than one-third the land's value. Municipal bond measures passed by Los Angeles, Santa Monica, Beverly Hills and Venice provided for that amount. Proposition 10, a state bond measure passed that year, provided $3 million for construction. Thus the predecessor of the University of California, Los Angeles, was established in Westwood and opened in 1929. The Los Angeles establishment reacted with horror. Newspapers and television headlined the story for days. Police patrols in Westwood tripled, and the L.A.P.D. assigned a 30-member antigang unit to capture Toshima's killer. On January 30, 1988, gang violence brought nationwide attention to Westwood Village when Karen Toshima, a 27-year-old passer-by, was killed as she crossed a Village street in a shootout between gang members. Her killer, Durrell DeWitt Collins, 23, was sentenced to two concurrent terms of 27 years to life in prison. In 2016, he was again denied parole until at least 2021. The episode led to the widespread impression that even affluent Westwood was not immune to the crime wave then ravaging Los Angeles. The Geffen Playhouse was built in 1929 at 10886 LeConte Avenue as the Masonic Affiliates Club, or the MAC, for students and alumni at UCLA. One of the first dozen structures built in Westwood Village, it was designed by architect Stiles O. Clements. The Los Angeles California Temple, the second-largest temple operated by The Church of Jesus Christ of Latter-day Saints, is on Santa Monica Boulevard in Westwood. The temple grounds also includes a Visitors' Center open to the public and the headquarters for the Church's missionary efforts in Los Angeles. The church purchased the land for the temple from silent film star Harold Lloyd in 1937, but did not open the temple until 1956. The temple grounds are also home to the Los Angeles Regional Family History Center (LARFHC), which is open to the public as well. It is the second-largest branch in the Family History Library system of the LDS Church, and contains more than 100,000 microfiche and 30,000 books. Located in the area is the headquarters for the Fox Sports Networks regional sports networks, as well as several other Fox-owned networks, including Fox Deportes and Fox College Sports. The Los Angeles County Department of Health Services SPA 5 West Area Health Office serves Westwood. Sixty-six percent of Westwood residents aged 25 and older had earned a four-year degree by 2000, a high figure for both the city and the county. The percentages of residents of that age with a master's degree or higher was the third-highest in the county. The Los Angeles Unified School District operates public schools. The zoned senior high school is University High School in West Los Angeles. UCLA Lab School Corinne A. Seeds Campus, formerly the Corinne A. 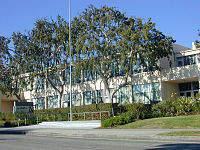 Seeds University Elementary School and renamed in 2009, is the University of California, Los Angeles laboratory school. The Los Angeles Public Library opened a branch in Westwood in 2005. The Westwood Recreation Center is in Westwood. The facility includes barbecue pits, a lighted baseball diamond, lighted outdoor basketball courts, racquetball courts, a children's play area, a community room, an indoor gymnasium with weights, and a picnic table. The center also has Aidan's Place, which opened on December 5, 2001. The place, named after wheelchair-bound Aidan James, is a playground developed for joint use by handicapped and non-handicapped children. Holmby Park is also in Westwood. 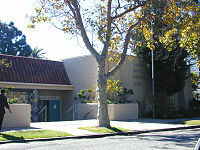 The Los Angeles Police Department operates the West Los Angeles Community Police Station at 1663 Butler Avenue, which serves the community. Law enforcement for the UCLA campus is the responsibility of the UCLA Police Department, a division of the independent, statewide University of California Police Department. As a state police agency, the UCLA PD has full law enforcement powers on and off campus. Fire and emergency medical services are provided by the Los Angeles Fire Department. UCLA Emergency Medical Services, a division of the UCLA Police Department, operates a Basic Life Support ambulance for the UCLA campus and supports LAFD on medical aid calls in the surrounding community. UCLA also maintains a small fire suppression apparatus staffed by campus fire marshals that responds to university-owned properties and assists the outside community when requested to by LAFD. ^ a b c Martha Groves, Seeking shoppers in Westwood Village, Los Angeles Times, May 6, 2008, Accessed May 6, 2008. ^ King, Danny (September 1, 2003). "Projects move forward on Westwood's Golden Mile". Los Angeles Business Journal. p. 3. ^ "Parole Suitability Hearing Results" (PDF). July 2016. Retrieved July 14, 2017. ^ Glionna, John M. (January 30, 1998). "A murder that woke up L.A.". Los Angeles Times. pp. A1. ^ School Brochure (Archive). University High School. Retrieved on March 27, 2014. "The attendance area that Uni serves encompasses the neighborhoods of West Los Angeles, Brentwood, Bel-Air, and Westwood." ^ "Famed UCLA elementary school gets new name." Los Angeles Times. March 10, 2009. Retrieved on March 29, 2014. ^ "Westwood Recreation Center." City of Los Angeles. Retrieved on March 19, 2010. ^ "Universally Accessible Playgrounds." City of Los Angeles. Retrieved on March 19, 2010. 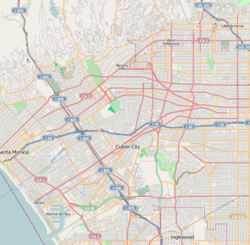 Wikimedia Commons has media related to Westwood, Los Angeles.